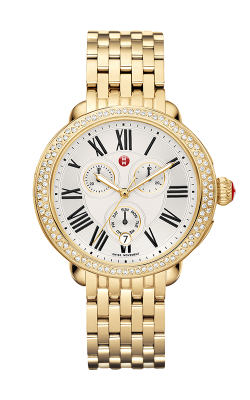 Michele MW21A01A1966_MS18EV235009 | Leslie Gold Watch Co.
As seen in Vogue, Harper's Bazaar, InStyle, Elle and Elle Accessories. One hundred glittering diamonds encircle the elegant Serein Diamond timepiece. Roman numerals and the signature MICHELE logo grace the silver tone chronograph dial. 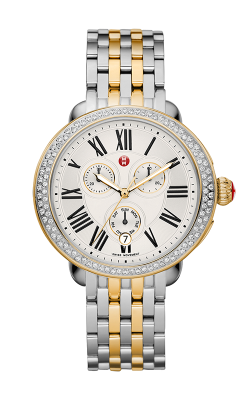 The stainless steel bracelet is interchangeable with any 18mm MICHELE strap.